Considering all the craziness going out in Egypt as of late, I thought it would be appropriate to highlight an Egyptian deity this week. I have to suspect it’s Set who’s behind the whole thing, what with his being the god of chaos. I already wrote about him, though, so instead we turn to Sobek. He’s the god of crocodiles, which were some of the most feared creatures in ancient Egypt. People prayed to him in order to protect themselves from his subjects. 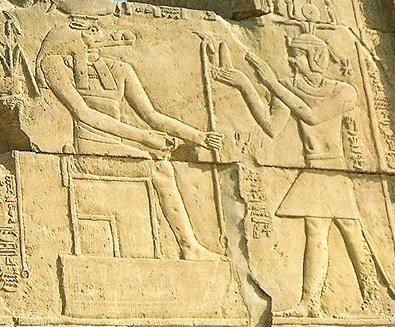 While it seems that the earliest mentions of Sobek show him as a dark god, he later came to be viewed as a protector, and a patron of the Pharaoh and his royal army. His main worship center was at the city of Arsinoe in the Al Fayyum region, which was called “Crocodilopolis” by the Greeks (like the giant statue in Dragon Quest V that I still haven’t gotten through). 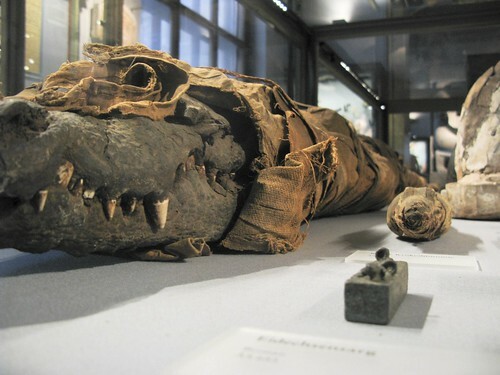 Temples of Sobek would often keep crocodiles, and mummify them when they died. 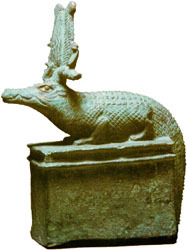 While crocodiles were sometimes associated with Set, Sobek appears to have been more often seen as an ally of Set’s opponent Horus. The crocodile god assisted in the birth of Horus, and rescued Horus’ own sons from the waters of Nun. He protected the dead from Set, and restored their senses. In some myths, he is even identified as the creator of the world, having risen from the waters of Nun to accomplish this task. As such, he came to be viewed as an aspect of Amun-Ra. I actually wasn’t aware that Egypt had a crocodile god until today, although it’s not much of a surprise, since they seemed to have gods with aspects of pretty much every animal they knew. I did, however, know about Offler, the crocodile god from the Discworld books. I have to suspect Terry Pratchett had Sobek in mind when he created Offler, since he does do a lot of research for his writing. 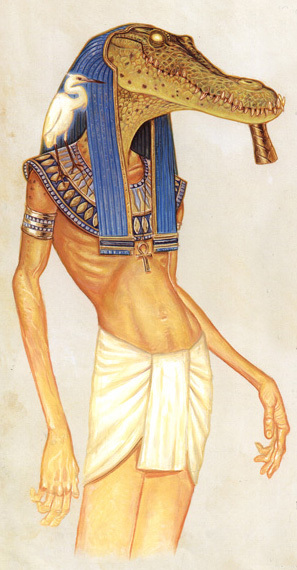 Offler seems to be a more important deity on the Discworld than Sobek ever was on ours, though, although worship of Sobek did last until Roman times. This entry was posted in Discworld, Egyptian, Mythology, Terry Pratchett and tagged al fayyum, amon, arsinoe, crocodiles, crocodilopolis, horus, mummies, nun, offler, pharaoh, ra, set, sobek. Bookmark the permalink. Hey buddy I liked your posting on the crocodile god Sobek, just wanted to say that. Stay healthy bro!